Concerning the relationship between Christian faith and depression, what misconceptions persist? What are the primary symptoms, causes, and cures for depression? In preventing or battling depression, what difference should faith in Christ make? What Bible truths, passages, and characters speak to the issue of depression? What extreme, unbalanced viewpoints are harmful when dealing with depression, or relating to victims of it? For effectiveness as a caregiver, what attitudes and behaviors are essential? These are among the questions David Murray addresses in his book, Christians Get Depressed Too (Reformation Heritage Books, 2010). Despite its release nine years ago, the book is pertinent today. Dr. Murray serves as Professor of Old Testament and Practical Theology at Puritan Reformed Theological Seminary in Grand Rapids, Michigan. For twelve years he pastored in the Scottish Highlands, which has one of the highest rates of depression in the Western world. There he dealt with many mature believers who nonetheless suffered deep depression, which spawned his interest and research on the subject. 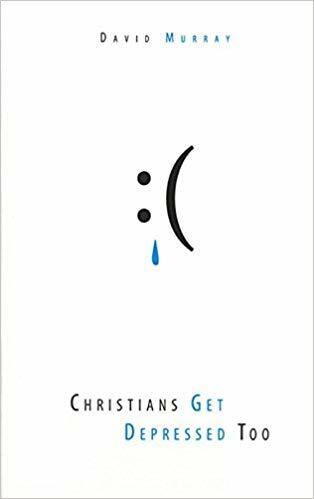 That experience prompts him to come to the defense of depressed Christians who are often harmed by misguided, unbiblical approaches to the dilemma. *Well-organized, easy-to-follow chapters explain the nature of depression, its complexity, causes, symptoms, and treatment strategies. *Clearly written, easy to understand, with a pastoral tone–not an academic or highly technical approach. *Balanced. Murray emphasizes the authority and helpfulness of God’s Word, while still gleaning from other sources as long as they don’t contradict Scripture. *Taps insights from other writers. In addition to examining biblical truths and texts pertinent to depression, Murray gleans from numerous authors who’ve written on depression. I especially appreciate the insights and quotes on despondency that he hoisted from giants of church history: Jonathan Edwards, Richard Baxter, and Charles Spurgeon, to name a few. *Incisive analysis that cites the strengths and weaknesses of both the “Nouthetic Counseling Movement,” popularized decades ago by Jay Adams, and the modern “Biblical Counseling Movement.” The verb form of “nouthetic” is from the Greek and means to admonish, correct, or instruct. The emphasis is on using Scripture to confront wrong behavior that spawns the despondency. While Murray acknowledges that unconfessed sin can cause depression, he doesn’t see a person’s direct sin as the typical cause. Here are a few excerpts that resonated with me. I (Terry) believe that persons who pit the sufficiency of Scripture against insights from psychology (the study of man) and medical intervention create a false dichotomy. God’s Word insists that creation “speaks” of God’s glory and “reveals knowledge” (Ps. 19:1-6). Insights about human behavior, the complex workings of the human body, and factors that affect mood are instances of God’s “common grace” for the benefit of mankind in general. Accepting help from sources outside the Bible–so long as God’s Word remains he ultimate authority–in no way compromises commitment to and the efficacy of the Bible. Pastors, Christian counselors, caregivers, and depressed persons who read Murray’s book will discover that it’s a small book with a big impact. If you google “David Murray and depression,” you’ll find video presentations and numerous articles he has written on depression. His book is an easy find on Amazon.